The U.S. Geological Survey’s Hawaiian Volcano Observatory (HVO) recorded an offshore magnitude-4.5 earthquake south the Island of Hawaiʻi on Sunday, December 18, at 6:30 a.m., HST. According to Brian Shiro, HVO’s Seismic Network Manager, this earthquake was centered about 59 km (37 mi) south of Ka Lae (South Point) at a depth of 36.5 km (22.7 mi). A map showing its location is posted on the HVO website at hvo.wr.usgs.gov/seismic/volcwe…. The earthquake was felt on the Island of Hawaiʻi, with the the USGS “Did you feel it?” Web site (earthquake.usgs.gov/dyfi/) receiving over 50 felt reports within an hour of the earthquake. Weak shaking, with maximum Intensity of III, has been reported across the island. At that intensity, damage to buildings or structures is not expected. Today’s earthquake occurred about 70 km (43 mi) southwest of Lō‘ihi, and was not caused by activity on that submarine volcano. The depth, location, and recorded seismic waves of the earthquake suggest a source due to bending of the oceanic plate from the weight of the Hawaiian island chain, a common source for earthquakes in this area. Aftershocks are possible and could be felt. The earthquake caused no detectable changes in Kīlauea Volcano’s ongoing eruptions, on Mauna Loa, or at other active volcanoes on the Island of Hawaiʻi. For information on recent earthquakes in Hawaii and eruption updates, visit the USGS Hawaiian Volcano Observatory website at hvo.wr.usgs.gov. A seismogram of the earthquake from a seismic station at South Point. 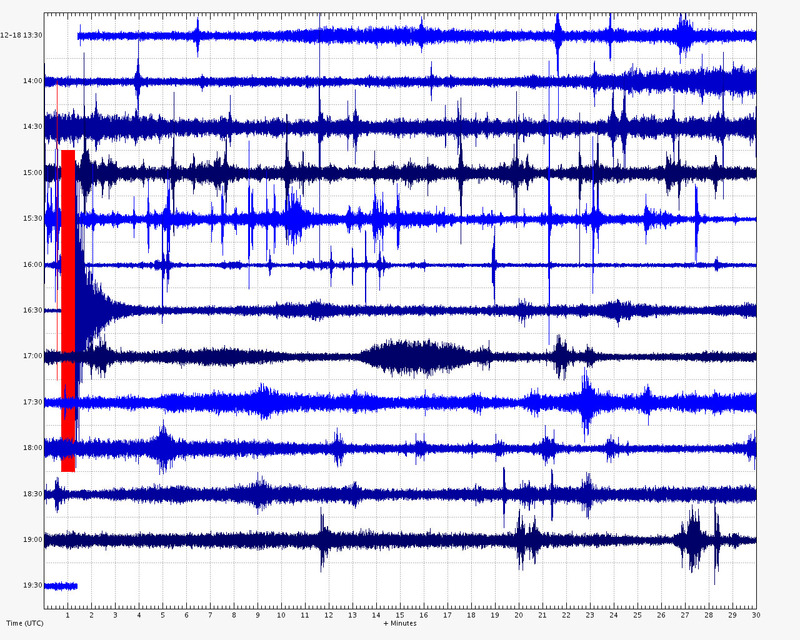 Recording via USGS/HVO.